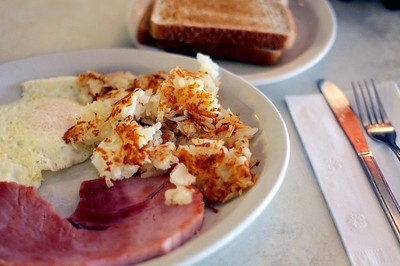 Sarah Nader - snader@shawmedia.com A popular dish at Little Chef in McHenry is ham and eggs served with toast and hash browns. Sarah Nader - snader@shawmedia.com Pat Callahan (left) of Johnsburg and her husband, Tom, enjoy breakfast at Little Chef in McHenry on Friday, February 8, 2013. 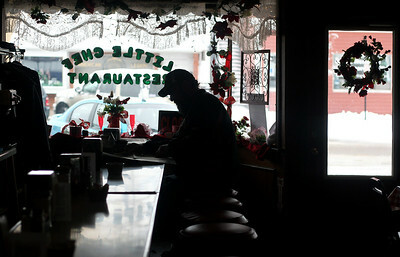 The Callahan's have been eating at the restaurant since it opened 43 years ago. Sarah Nader - snader@shawmedia.com Owner Terry Fair works at Little Chef in McHenry on Friday, February 8, 2013. Terry took over the 43 year old business from her mom Sherry about four years ago. Sarah Nader - snader@shawmedia.com Gary Gilpin of McHenry reads his newspaper at the counter while enjoying breakfast at Little Chef in McHenry on Friday, February 8, 2013. The restaurant has been around for 43 years and is known for the biscuits and gravy, eggs benedict, ham and eggs and their homemade soup. 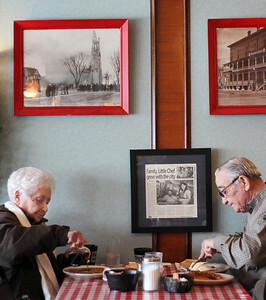 Pat Callahan (left) of Johnsburg and her husband, Tom, enjoy breakfast at Little Chef in McHenry on Friday, February 8, 2013. The Callahan's have been eating at the restaurant since it opened 43 years ago.